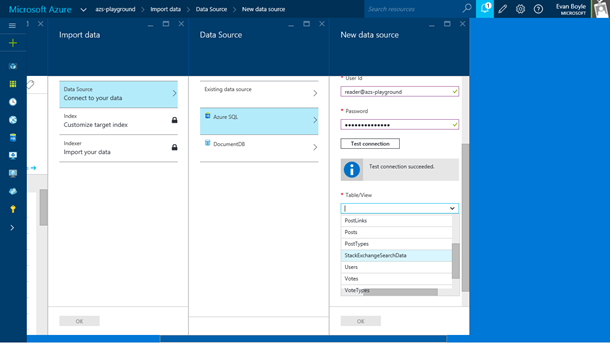 Over the last few months, we’ve been working on making it as easy as possible to get started with Azure Search. One barrier to getting started can be loading your data into the service. Indexers for SQL and DocumentDB make loading your data a piece of cake. 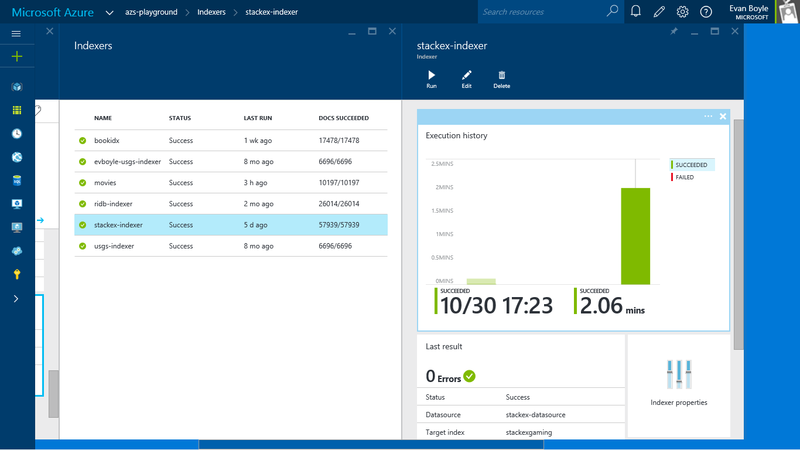 In response to popular demand, we’re happy to announce we’ve added full support for creating and monitoring indexers in the Azure Search Portal! You can now get your data into Azure Search with zero code required. We’ve built a powerful experience that reduces friction by doing things like schema detection and displaying compatible databases under your subscription. Let’s take a look. We’ve built a guided workflow called “Import Data” that walks you through getting everything set up. With our new database pickers, you can scan a list of databases under your subscription and select it without having to worry about looking up or formatting connection strings. After you select your database, we’ll automatically detect the user and let you test the connection. 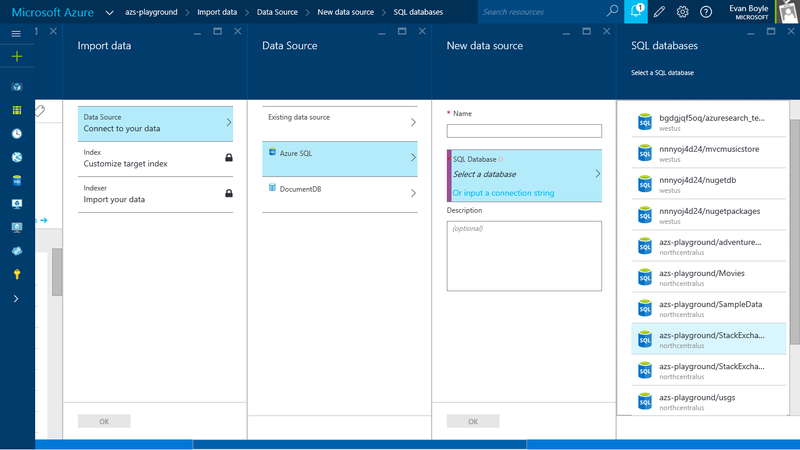 Once connected, a list of tables (or collections for DocumentDB) is loaded for you to browse. Previously when creating an indexer, you had to define an index schema from scratch. That can be tedious when you have hundreds of columns, especially if you’re crafting the payload by hand. 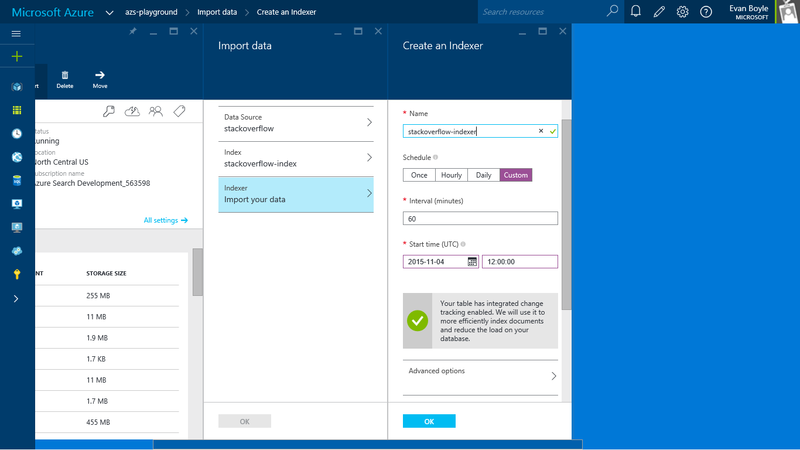 With the new import data experience, we detect the schema from your data source and give you a starting point. This includes suggestions for types and the key value as well. Making sure your data stays fresh is important, and you can easily setup scheduled executions to accomplish just that. You can even schedule runs during off peak hours such as the middle of the night to avoid extra load on a production system. Indexers support change tracking to help reduce the load on your database as well. If you’re using SQL Integrated Change Tracking then we’ll set it up for you automatically. Otherwise you can specify a high watermark policy. Once you’ve set up your indexers you’ll want a way to monitor execution and make sure everything is running smoothly. The indexer monitoring page gives you a quick overview of health for all indexers, showing status of the last run, as well as document counts. You can drill down on an individual indexer to track its executions over time. There’s even support for chasing down document level errors during indexing. 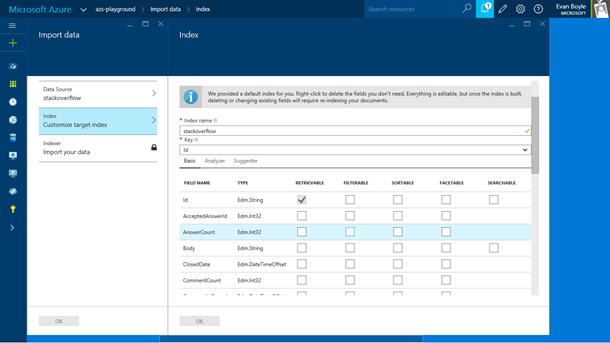 We hope that the new import experience makes getting started with Azure Search a piece of cake! If you have questions, please feel free to reach out in the comments below, or leave your feedback on UserVoice.